Myth Bustin Monday – TRUTH: Fires Benefit Wetlands! 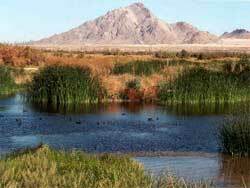 Clark County Wetlands Park, Las Vegas Nevada. Photo from Vegas.com website. When you think of wildfires, you may not immediately think of wetlands. But the seldom seen blazes in these ecosystems carry incredible ecological benefits! Wetlands are areas of land that are saturated with water, either permanently or seasonally. What makes wetlands so distinct is the vegetation of the aquatic plants that grow there are adapted to the unique hydric soil (i.e. soil that is low in oxygen). Wetlands are key areas of water purification, flood control, carbon sinks and shoreline stability. They are also considered one of the more biologically diverse ecosystems, due to serving a wide array of plants and animals. The idea that naturally occurring fire has substantially shaped the form and function of wetland ecosystems can be difficult to imagine. This association is not naturally made; largely due to another misconception that the hydrology of a wetland is constant (i.e. it is submerged in water all the time). Of course, during prolonged droughts organic wetland soils may dry sufficiently to ignite and burn. But even in years with average rainfall, the hydrology of wetlands fluctuates greatly with even some wetlands completely drying out for parts of the year! In addition to drought periods, wetlands will and must burn. For example, in the southeastern USA where wetlands often occur close to frequently burned lands, wetland fires can occur with surprising frequency—as often as every 1 to 2 decades and historically (before significant human society development) as frequent as every 1 to 3 years (Snyder 1991, Ewel 1995). In 2015, Former University of Florida Institute of Food and Agricultural Sciences Post-Doctoral Research Associate, Adam Watts conducted multiple studies that examined the effects of wetland fires in the Big Cypress Preserve in South Florida and found that wetlands can become deeper if fires of mixed intensity burn organic soils thereby changing how water is stored and distributed in wetlands and the surrounding areas. Fires in wetlands with deep organic soils (i.e. soils made of primarily decaying plant matter) can increase the amount of time that a spot in a wetland will remain underwater, allowing for more water storage in the wetland, expansion of aquatic species and refuge in the drought periods for a number of both plant and animal species. A 2012 study by Mercedes Salvia et al, found that wetland areas that experienced fires had vegetative cover restored to values similar or better than undisturbed wetlands with in the first growing season post fire and had a significant increase in species richness than compared to the undisturbed wetlands! While research in fire ecology in all ecosystems continues to grow, the fraction of studies dedicated to wetlands is small (Christensen 1985). However wildfire has played and continues to play an important role in shaping the structural and functional characteristics of the wetland ecosystem, so the next logical question is “Why do we suppress it?” The answer is that people fear and misunderstand wildland fires and want to do something about them- i.e. try to put them out no matter where they start. Unfortunately this suppress at all costs policies has undoubtedly left our wetland ecosystems missing a crucial step in their natural succession which is necessary to their continued existence, health and function. We at the John Muir Project are working endlessly to educate the public on the ecological benefits of fire in all ecosystems. By staying up to date on new research and relaying that research to the public we believe that together we can force management changes which will be better for the environment and better for all of us who inhabit this planet!